Hydrogen sulfide (or hydrogen sulphide) is a chemical compound with the formula H2S. It is a colorless, highly toxic, flammable gas with a characteristic foul odor. It also occurs in swamps and sewers as a result of the bacterial breakdown of organic matter in the absence of oxygen, which is known as anaerobic digestion. Hydrogen sulfide is a highly toxic and flammable gas (flammability range: 4.0 to 46 volume % in air). It is heavier than air and tends to accumulate at the bottom of poorly ventilated, confined spaces. Hydrogen sulfide and oxygen burn to form sulfur dioxide (SO2) and water. In general, hydrogen sulfide acts as a reducing agent. At high temperature (about 1000 °C) and with the use of a catalyst, sulfur dioxide will react with hydrogen sulfide to form elemental sulfur and water (in the form of steam). This is commonly accomplished by the Claus process, the primary method of converting hydrogen sulfide into elemental sulfur. Hydrogen sulfide is readily soluble in water, amounting to 4.1 grams per litre of water at 20 °C which is equivalent to 0.41 weight %. 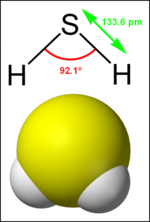 When it is in solution in water, the H2S forms a weak acid (sometimes referred to as hydrosulfuric acid) containing hydrosulfide and sulfide ions (HS− and S2−). The solubility is further enhanced in alkaline solutions due to increased ionization. Hydrogen sulfide reacts with metal ions to form metal sulfides, which may be considered the salts of hydrogen sulfide. Some minerals are sulfides. Hydrogen sulfide reacts with alcohols to form thiols. 0.00047 ppmv is the recognition threshold, the concentration at which 50% of humans can detect the characteristic foul odor of hydrogen sulfide. At 100 – 150 ppmv, the olfactory nerve is paralyzed after a few inhalations, and the sense of smell disappears, often together with awareness of danger. At 200 ppmv, the central nervous system is depressed. At 500 ppmv, the cardiovascular system is depressed. At 1000 ppmv, the central nervous system is paralyzed and death occurs. ↑ Carl L. Yaws (June 25, 2001). Matheson Gas Data Handbook, 7th Edition. McGraw-Hill. ISBN 0-07-135851-4. ↑ Peter D. Bryson (September 1996). Comprehensive Review In Toxicology For Emergency Clinicians, Third Edition. Taylor and Francis, p. 368. ISBN 1-56032-612-3. This page was last modified 08:27, 25 March 2011.